Joe Kennedy III: the Massachusetts Congressman is the only member of the family currently holding elected office. President John F Kennedy's visit in 1963, the first ever by a serving US president, remains one of the most iconic events of 20th Century Ireland. For four hours in Dunganstown, six-year-old Kathleen Doyle stood waiting patiently for the most powerful man in the world to walk by. Breda Ryan's husband Paddy was the mayor of Galway. The 80-year-old widow describes the occasion as "an unforgettable time". David McCullagh What better way to greet a distinguished guest than with a garden party on the lawns of Aras an Uachtarain. What could possibly go wrong? ONE OF the most striking aspects of President John F Kennedy's Irish visit in June 1963 was the absence of the issue of the partition of Ireland from his public rhetoric. AS a teenager in Cork, Patrick Curley had pored over 'Time' magazine articles about John F Kennedy. Now, just a few years later, he was standing two feet away from him. It took 45 years for legendary Galway photographer Stan Shields to gain recognition for the incredible shot he took of US President John F Kennedy from the front of the open-topped limousine. From the time President Eamon de Valera issued his formal invitation on March 27, 1963 to the American President, An Garda Síochána, under Commissioner Daniel Costigan, had a crucial role to play. 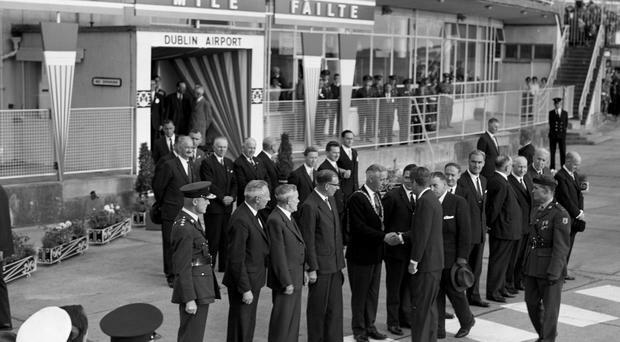 AFTER the Boeing AF-1 carrying President John F Kennedy on his 10-day tour around Europe landed in Dublin Airport, there was some confusion amongst the international press corps about exactly how many people had come out to welcome their favourite relative. Journalism is "the first rough draft of history", according to a remark attributed to 'Washington Post' publisher Philip Graham, and Irish newspapers certainly seem to have viewed John F Kennedy's visit in June, 1963 in this light. No Irish cliche was left unturned when the international media came to Ireland to cover the JFK visit. Some of the dispatches were humorous, others mocking and often ever so casually racist in tone as correspondents wrote about the visit. Clearly, there was a huge effort to ensure that the reception given to Kennedy would be on a scale not witnessed for any previous visitor, but it seems that caution and cost consciousness still prevailed in some quarters. The legacy of JFK: in a special article, US Secretary of State John F Kerry reflects on the 50th anniversary of his visit to Ireland. FINAL preparations are taking place in New Ross, as the town gets ready to mark the 50th anniversary of the visit of John F Kennedy. THEIR visit had the air of a pilgrimage and they brought with them the Eternal Flame which burns at the grave of John F Kennedy. John F Kennedy actually opened his speech to the Oireachtas with a factual inaccuracy. He told the assembled Irish parliamentarians that "the 13th day of September, 1862, will be a day long remembered in American history. At Fredericksburg, Maryland, thousands of men fought and died on one of the bloodiest battlefields of the American Civil War." Mary Ann Ryan cherished her meeting with President Kennedy and sadly attended his funeral. 'We're in right trouble now" – the immortal words of the mercurial Andy Minihan seconds before US President John F Kennedy took to the stage on the quayside in New Ross. As a 12-year-old, wide-eyed boy, Owen Casey sat mesmerised by the young politician addressing the crowd at Cork City Hall. He hung on his every word and was brimming with admiration for the gifted orator in his midst. The dash back to Dublin from Cork began at 11.30am as President Kennedy was hosting lunch at the US embassy at 1pm. It was a dark and dank June evening in Dublin when the roar of Air Force One made its presence felt to the expectant crowd. Waiting at the red carpet was one man in particular who had come to embody Ireland. A SPARK lit at the 'Eternal Flame' at the graveside of former US President John F Kennedy will be whisked to Ireland to mark the 50th anniversary of his historic visit. CAROLINE Kennedy will meet President Michael D Higgins today as part of a special celebration making the visit of her father to Ireland 50 years ago. THE Obamas may have left town, but Ireland hasn't finished with American politicians just yet. Marie Dempsey was 14 years old and a sixth-class pupil at the Convent of Mercy School in Galway city on the day she turned green. 'If the day was clear enough and you went down to the bay and you looked west, and your sight was good enough you would see Boston Massachusetts." Not only did the mayor of Limerick orchestrate the visit of JFK to Limerick and deliver his favourite speech of the trip, but she even designed her own hat for the auspicious occasion. They were three magical days in late June 1963 which brightened the lives of hundreds of thousands of Irishmen and women who had lived through the gloom and despondency of the 1950s – a decade of mass emigration and high unemployment in a republic, recently declared, which had appeared, at times, to have been teetering on the brink of economic failure. On 20 April 20, 1963, the White House and Aras an Uachtarain simultaneously announced President Kennedy's acceptance of President de Valera's invitation to visit Ireland. The strong rapport between Ireland's ambassador to the USA in 1963, Thomas Kiernan, and John F Kennedy was central to the success of President Kennedy's visit to Ireland. As they watched the helicopters approaching the children in O'Kennedy's GAA Park took a collective intake of breath. Who was the Irish-American who became the 35th President of the United States? A random selection of little-known facts about the President. As the limousine slowed down, the nuns outside Wexford's Loreto Convent could not believe their eyes. President Kennedy would have boarded a chariot – to be pulled through the town of New Ross by 12 men – if Andy Minihan had had his way. Lensmen have licensed the Irish Photo Archive to digitise and preserve Lensmen's extensive collection, which was begun by Andy Farren and Padraig MacBrian in 1952. Last year, the task of digitising the collection began – up until then, the archive had been relatively untouched. A French chef, fine china... and beef! 'Shrimp cocktail: a teaspoon is used. Seventy four in stock," says a handwritten note in pencil at the top of a cutlery inventory in Iveagh House, home to the Department of External Affairs.